Please refer to our stock # 2889/2831 when inquiring. 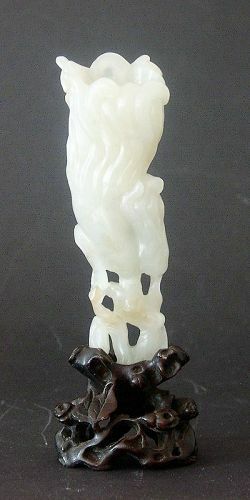 A Chinese jade vase, carved in the form of a tall thin finger citron. The stone is of very pale hue close to the colour of the pictures, the body is thinly rendered and the exterior well detailed. It comes with its own custom made wood stand. Age: 18/19 C. size: 10 cm high. condition: very good, no breaks , no restoration.